Is France broadening its surveillance powers or just rubberstamping the existing illegal ones ? Remember the « ce n’est pas illégal, c’est a-légal » episode ? That is what the French government is claiming that the surveillance laws being voted are about : no new surveillance powers – just giving a legal framework to the existing illegal ones… Which are implicitly confessed by the way. So thanks – I guess we should feel happy that open bar surveillance will soon be done entirely legally instead of illegally ! By the way, there was no question of judicial oversight : “in the context of the antiterror fight, day to day, it’s impossible”… Using the T word to steamroll objections never gets old it seems – and judicial oversight is such a drag on productivity that we should be thankful for the savings that foregoing it will bring to the French budget. Our review suggests that the information contributed to terrorist investigations by the use of section 215 telephony meta-data was not essential to preventing attacks and could readily have been obtained in a timely manner using conventional section 215 orders. 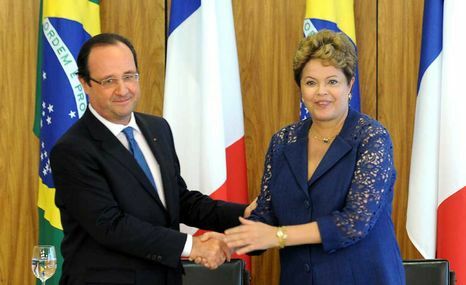 Oh – and here is a picture of François Hollande expressing support to Brazil’s Dilma Roussef in her crusade against Internet surveillance. No, I don’t understand either. 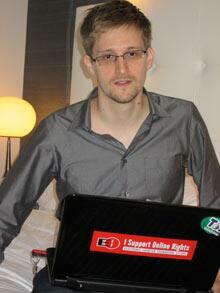 When even the USians frame us as surveillance hypocrites, you know that some soul searching is long overdue. Global trends in governance, 1800-2012. Source: Polity IV Project. African Trends in Governance, 1960-2012. Source: Polity IV Project. No longer propped up by the major powers, autocracies everywhere have fallen with the end of the Cold War. But whereas they have globally mostly given way to democracies, in Africa they have not : anocracy is the dominant form. So that is the word of the day for me: anocracy – it feels good to have a word to label the sort of mafia cartels that seem to rule most of Africa. We have already seen how the myth of redemptive violence is played out in the structure of children’s cartoon shows (and is found as well in comics, video and computer games, and movies). But we also encounter it in the media, in sports, in nationalism, in militarism, in foreign policy, in televangelism, in the religious right, and in self-styled militia groups. What appears so innocuous in cartoons is, in fact, the mythic underpinnings of our violent society. The psychodynamics of the TV cartoon or comic book are marvelously simple: children identify with the good guy so that they can think of themselves as good. Once children have been indoctrinated into the expectations of a dominator society, they may never outgrow the need to locate all evil outside themselves. Even as adults they tend to scapegoat others for all that is wrong in the world. They continue to depend on group identification and the upholding of social norms for a sense of well-being. 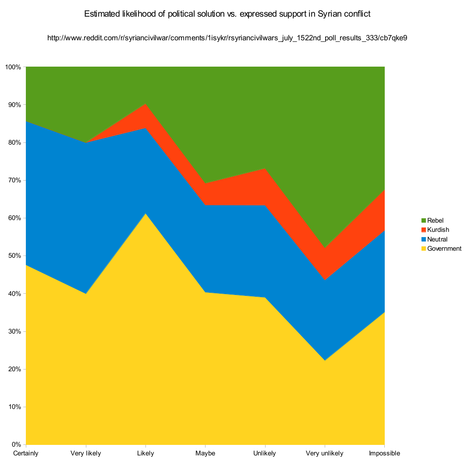 Which Syrians believe that a political solution to the conflict is likely ? 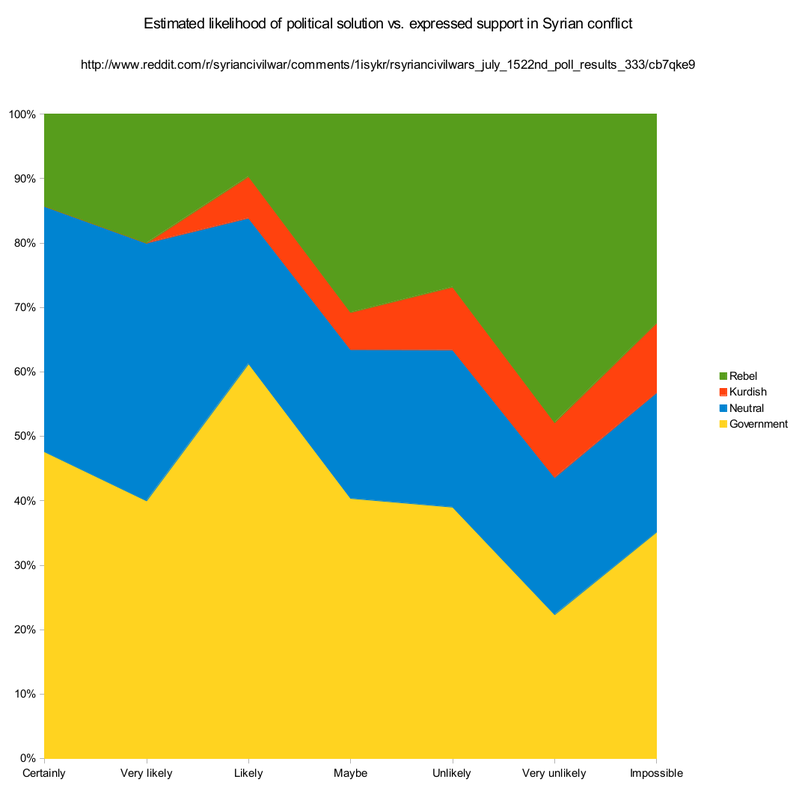 Uptodatepronto posted the results of the July 2013 poll of r/SyrianCivilWar opinions in the Syrian conflicts. With only 333 samples, a huge unknown self-selection bias and who knows what ballot stuffing, this data must be taken as anecdotal. Who do you support in the Syrian Civil War ? Do you believe there can be a political solution to the conflict ? Who, if anyone should the United States, France and Britain arm ? The possible answers to the first question were quite sparse, so I decided to aggregate them to have large enough samples in each category… I’m sure that many will object to the mixed bag that I made of the ‘Government’ and ‘Rebels’ aggregates – did I mention that I’m a clueless foreign observer ? I consider the first and third questions to be redundant : while a majority rejects foreign injection of weapons into the conflict, there is a strong correlation between support for a given side and desire to see it armed… Though two government-side supporters want arms for the FSA and one government-side supporter wants them for ‘anyone who opposes the Assad regime’ – remember what I said about the data ? Those could be interesting hypothesis to test in a wider and more disciplined survey… So, more than ever, the real conclusion is : moar data ! The worksheet I produced this from is available here but, again I must emphasize how lacking the raw material is. On the 13th June, Fleur Pellerin (French Minister Delegate for Small and Medium Enterprises, Innovation, and the Digital Economy) gave a vibrant speech during the inauguration of the Mozilla Foundation’s new office in Paris. Free software is a crucial asset for our economy, in more than one way. First, it enables the struggle against technological dependance upon actors who own our everyday computing tools – it is therefore a true guarantee of digital sovereignty. 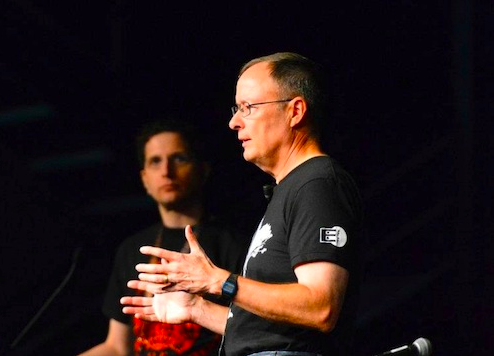 Furthermore, as we see today and contrary to popular myth, free and open source create jobs. Original business models have been invented and they are important factors in productivity and competitiveness for both private and public sectors who can in this way better control their holdings and concentrate their efforts on their specific value additions. Finally, free software undermines rent-seeking behaviours adverse to innovation, and therefore aids in the emergence of new economic champions. Will the bold ideas instantly translate into action ? No one expects magic – but with policy laid out so clearly, there is reason to believe that the French government is headed in the right direction. Let’s take note of those good intentions, keep an eye on the actions that should follow, spread the word that free software is a crucial economic asset and vote for those who understand that ! “Numérique” not “digital” sacrebleu !